A. Shilov is the successor of painting in the style of Russian realism. During his life, he painted many landscapes and still lifes, but he considered himself a painter still a portrait painter. His portraits reflect the real image, on the canvas everything matters. The artist has no chance, and the turn of the head, folded hands, entourage – everything is done with a hidden meaning. The work “Self-portrait” is of particular importance in the painter’s creative path. He did not just portray himself, he reflected his character, passion and life principles. The artist sits relaxed, leaning back. In the hands of holding a brush and palette. One gets the opinion that the painter was only torn away from work, he turned his head for a moment. Her lips froze in a slight smile, and her eyes expressed kindness. Curly shoulder-length hair favorably complements the image of the artist, it seems that it is such a hairstyle that is characteristic of the representatives of the painting. Throwed dressing gown makes the homely atmosphere, perhaps it was in the studio that the painter felt at home and rarely parted with his colors. But the chair is not an attribute of the home. This work of art is a unique handmade museum piece. AM Shilov also had an artistic taste in pieces of furniture. Surrounding the master portraits, examples of his work. This once again speaks of the artist more as a portrait painter, he himself attributed to the category of the master portrait. The master’s pose is confident, he put his hand on the armrest, he feels relaxed. The portrait exudes harmony and tranquility. It is safe to say that the painter was doing what he loved. 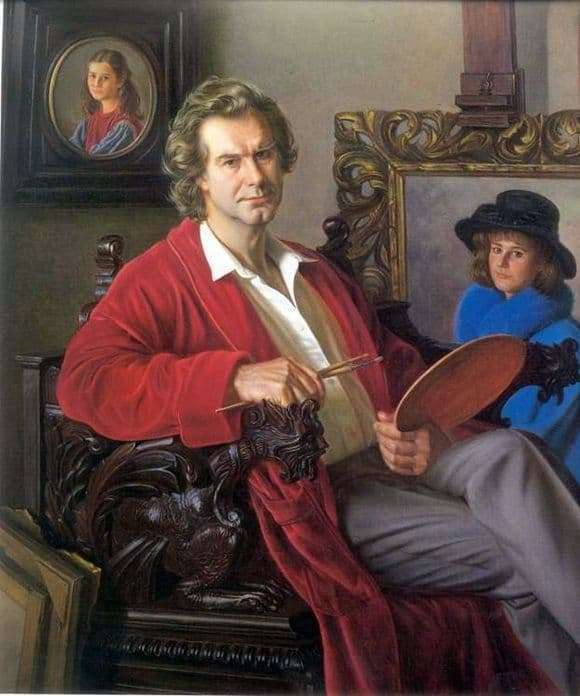 “Self-portrait” is a kind of message to descendants from the great representative of the Russian art school. This work is about the main thing in life and harmony in life. The picture reveals the face and character of the artist, his life.